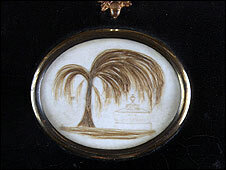 This pendant is set with what is supposed to have been Jane Austen’s hair. A lock of which was set for Fanny Austen, and another sent to Jane’s dear friend, Anne Sharp. Cassandra Austen took the time, just four days after her sister’s funeral, to pen a letter and send some treasured mementoes to Jane’s friend, the governess and amateur playwright Anne Sharp. It was the second letter she is known to have written after Jane’s death. The first was to Fanny Knight: the niece whom Anne once taught. When I first learnt that Anne was the only person outside of the Austen family and household to receive such poignant trinkets, I assumed that the note accompanying Jane’s lock of hair, pair of belt clasps and silver needle would have been infused with a sense of shared love and grief for Jane. But, when I tracked down Cassandra’s letter, I detected instead a barbed quality that hints at a deep conflict between Jane’s sister by birth and the sister-friend she singled out. I long to read the letter Anne sent to Cassandra, to measure for myself the friend’s ‘ardent feelings’ against the sister’s stoicism. But Anne’s voice has been largely silenced – like that of so many working women of the past. In her dotage, Cassandra re-read all of Jane’s correspondence one last time. Secretly, she then removed from her cache all those letters she felt might compromise the mythology her family had constructed of Jane as a meek, conservative maiden aunt, who dabbled with storytelling in between chores. And finally Cassandra built up a fire and, one by one, fed her sister’s most personal words to the flames. But surviving letters, like the one above, and several volumes of unpublished diaries have allowed us to reconstruct something of Jane’s incendiary relationship with a woman of lower social standing – a sister-friend who shared her fieriness, whose ‘ardent feelings’ provided a welcome contrast to her sister’s ‘tranquil’ restraint. Cassandra’s envy of Anne’s intimacy with Jane emerges in her insistence that ‘What I have lost, no one but myself can know, you are not ignorant of her merits, but who can judge how I estimated them?’ Cassandra could have become close to Anne through their shared bereavement. After all, Jane had drawn both intelligent spinsters into her inner circle. But the sister found the sister-friend’s spirited personality a source of pain during this desolate time. The letter is freighted with Cassandra’s conflicting emotions: her desire to honour her sister’s highly-valued relationship competing against the dual demands of snobbery and envy. She feels compelled to offer the hand of friendship to the woman her sister so loved: ‘If any thing should ever bring you into attainable distance from me we must meet my dear Miss Sharp’. But she will not go out of her way to visit the woman her sister called ‘my dearest Anne’, nor will she offer any specific hospitality. So, imagine my surprise when I discovered that Anne stayed in Chawton Cottage with Cassandra for several weeks in 1820 – three years after Jane’s death. We know then that the fraught relationship between sister and sister-friend endured against the odds. But from this answer more questions arise: How did the pair move from competition to compassion? What took them from half-hearted invitations to residing under the same roof? How did their relationship develop and change during this time? These questions send me back to the diaries, back to the letters that survived the flames, back into the realms of my own imagination where Anne sits beside Cassandra, reminiscing about their beloved Jane, a fire roaring in the grate. When we decided on this month’s challenge, I knew straight away which of our profiled authors I would like to raise from the dead. 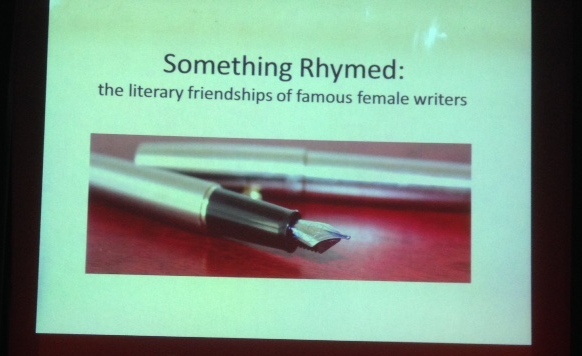 Even Jane Austen couldn’t sway me from beyond the grave, although it was a Wordsworth £1 classic edition of Emma that, as a young teenager, initiated me into the world of female authorship. I don’t need to conjure up Austen’s ghost to enjoy her dry humour, and her face – with which everyone in Britain will become intimately acquainted once the new £10 banknote is issued – was recorded for posterity by her sister Cassandra. Although Austen’s family destroyed much of her correspondence, the writer with whom I would love to make contact is far more of an enigma: all her literary works have been lost and her portrait was likely never painted. Anne Sharp, the amateur playwright so valued by Austen, has been silenced for centuries. The intelligent, spirited voice of this governess in the employment of the Austen family has survived only in snippets. But when she does speak up across the ages, for example in Austen’s records of Sharp’s feedback, her astute critical faculties make us sit up and take note: here was someone who read with sensitivity and, despite the mighty class divide, felt at liberty to express her thoughts. Perhaps it was this outspokenness that led Austen’s nephew to describe Sharp as ‘horridly affected but rather amusing’ – a phrase that brings to mind a neighbour’s portrayal of Austen as the ‘silliest, most affected husband-hunting butterfly’. Like Austen, Sharp never did wed although marriage would have been the surest path to financial security. Unsurprisingly, little was recorded of Sharp’s romantic history. But we do know that her famous friend turned down a proposal from a wealthy man, and engaged in at least two other romantic liaisons. Yet the pernicious myth persists that Austen was too plain to attract suitors. I once dragged a new squeeze to see the original portrait of Austen during a first date at the National Portrait Gallery. We failed to find anything unattractive in her appearance and I couldn’t help but feel that her alleged plainness would never have caught on had she not remained single. Cassandra actually described Austen as ‘triumphing over the married women of her acquaintance, and rejoicing in her own freedom’ – an image that complicates the prevailing notion of her romantic suffering. While Sharp’s single lifestyle would also have afforded her certain freedoms, it must have been a hard slog too – much more so than for Austen, whose only household responsibility was the preparation of tea and toast. After years of earning her crust as a governess for various wealthy families, she managed to set up her own boarding school in Everton. She spent the rest of her days in this area, living in York Terrace – a relatively prosperous street with views across the River Mersey to my hometown of Birkenhead. I would love to learn from this working woman how she managed to do so well from such humble beginnings, and whether she ever considered giving up her independence and her toil for the perhaps easier option of marriage. Perhaps my subconscious had been trying to tell me something when I dragged that poor date to view the painting of Austen: it was, in part, her independence that allowed her to pen those much-loved novels warning against ill-judged marriages. And it is her friend Anne Sharp – whose portrait I will never see – whose example reminds me that it was possible, even then, for a woman to make her way, ‘rejoicing in her own freedom’.